Some time ago I presented here an infographics on present perfect tense. This infographic contains a lot of interesting information but when I tried to teach the present perfect tense using it, I found out that I failed. That is why I have prepared this new one where I try to introduce the form and the basic usage of the present perfect tense. To teach the grammar successfully though the students have to know the past participles. You can learn present past participles here. There is mind map and three games to learn 40 of them. This mind map shows the form of present perfect tense and the basic usage. We have used a rap before to explain the grammar. You can see the explanation of the present simple and present continuous tenses here and the rap presentation of past participles here. Play this rap after reading the graphics above and it should help you memorise the form and the usage of the grammar. And now it is time to practise the grammar by playing some games. In the first game you should choose the correct form to create the tense. Thus you will practise the past participles and the correct form of the verb “To Have”. In the second game, your task is to create correct questions. You can play other games for example here in our post Present perfect basic. I hope this post helped you understand the usage and form of the present perfect tense better. You can find more grammar posts on our blog. For example, there is a post on Second conditional or creation of questions starting with HOW. Enjoy. can’t wait to try this one too…i guess it would be enjoyable. These ideas are meaningful in learning and teaching. I would really appreciate you keep on sharing. You might vary materials within main skills and subskills. I apprerciate the effort you make. Lots of and lots of people take advantage of this, at least my students. The next post will be on reading and listening. I hope you will find it useful. lovely clues, and practice for my sts. Thanks a bunch!! I am glad that I could help you with the present perfect tense. You are a genius, Present perfect in a rap song !!!!! My students will love it . Extremely high dose of creativity! I need some information about past perfect and past perfect continuous. There is a post on past perfect. I have not planned a post on past perfect continuous yet. Maybe in the future. 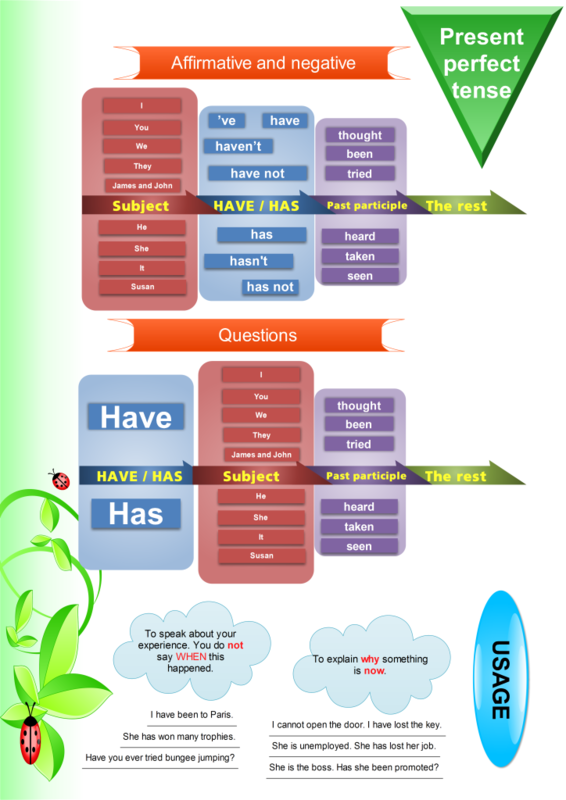 Hiya, I’m so glad to chance upon your infograhics on present perfect tense. Can I print this to teach my nephew who has Autism ? I think it will help him to get a better grip this topic. Thank you. Yes, everybody can print the infographics if they do not want to sell them.